Although very different from deadbolt locks, keypads and standard door locks, padlocks are one of the most common types of locks in both residential and commercial settings. At your house, you may have one on your fence to secure your gate. Or perhaps there’s one on your shed. You might use one to secure your bike to a bike rack in public settings if you ride a lot. In a commercial setting, there may be padlocks safeguarding locks, hazardous or emergency items or lockout devices. In a nutshell, a padlock has the purpose of any other type of lock – to guard against vandalism, theft or harm. Specifically, a padlock is a portable lock with a shackle that passes through an opening, hence a fence to secure a gate or an opening to secure the contents of an outdoor shed. 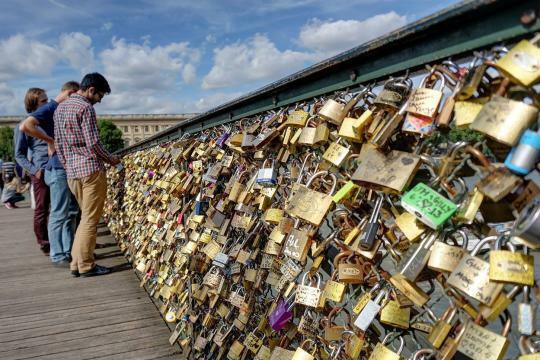 The roots of the padlock date all the way back to 500 B.C. when merchants traveling ancient trade routes used them to safeguard their goods. Padlocks have advanced over time, both in terms of sophistication and security, and by the 1930s locksmiths began fabricating padlocks via die casting. This die casting method was not only efficient and affordable, thereby making padlocks more widespread than they had been before, but the method also allowed locksmiths to create padlocks of virtually any shape or size – essentially a padlock for every and any application. We already told you in the opening how padlocks consist of a shackle. They also consist of a body and a locking mechanism that secures it. Padlocks are U-shaped, and thereby able to adequately secure whatever it is that requires securing whether it be in a commercial or residential setting. When unlocked, the U-shaped shackle dislodges from the padlock locking mechanism and when locked, the shackle is firmly and securely fitted into the mechanism. Integrated: Typically older models of the locking device, integrated padlocks almost always require a key to access the lock. Specifically, integrated padlocks are those that directly engage both the shackle and tumbler. Laminated: A laminated padlock is one in which its body is layered various pieces of metal. This metal is essentially stacked on top of each other in layers to provide a toughness that’s not easily cracked and cannot easily be tampered with. Lockout: These are padlocks designed for use in lockout programs in a commercial setting. In order to limit access to the lock itself, usually only one key is fabricated. Weather resistant: Standard padlocks will work fine outdoors for a little while, but over time as they’re exposed to the elements, they’ll rust or corrode to the point where the lock cannot be accessed. That’s where weather resistant padlocks come into play – they’re either designed to protect the lock from Mother Nature or built from materials such as stainless steel, which are weather resistant in nature. Weather resistant padlocks are ideal for backyard sheds and other outdoor applications. Combination: You might have had a high school locker that used a combination padlock. Simply put, instead of inserting a key into the lock to access it, combination padlocks work via rotary dial. High security: As we previously mentioned, if you don’t have the right type of padlock for your application, it greatly increases the chances that the lock may be tampered with. That’s where a high security lock comes into play. High security locks offer one or more enhanced padlock options to up their level of protection against theft and tampering. These options may include a hardened shackle, shrouded shackle, pick resistant cylinder or a locking mechanism that’s been reinforced to resist and deter prying. High security padlocks are ideal for protecting confidential data in commercial settings as well as residential safes and safe deposit boxes. Generally speaking, padlocks are available in several different types of materials. These include standard materials, such as aluminum, stainless steel and even plastic to more sophisticated materials like titanium and hardened steel. When it comes to types of locks, padlocks are without a doubt one of the most popular in commercial and residential settings. They’re also generally very affordable and come in a variety of shapes, sizes and styles. For more information on padlocks and whether or not a padlock would be the right fit for your various commercial or residential purposes, contact Great Valley Lockshop today. Reach us today by calling (610) 644-5334, sending an email to [email protected] or through our contact form!